Drone was the word of the day for this double headline bill of Mugstar and The Warlocks; a promotion collaboration between Bam! Bam! Bam! and Harvest Sun. Setting the hazy mood, Strange Collective took to the stage unassumingly and began their set. Pounding, incessant drums (à la Stephanie Bailey of The Black Angels), repetitive chord progressions, thin reverb laden guitar lines, and snatched vocals; all classics tropes of drone rock. On top of this they added a slight feel of punky urgency to some tracks. The discourse with the audience was at times shy, and this was perhaps explained towards the end of their set when they announced that it was only their second gig. It also accounts for their lack of an online presence. However, speaking to their guitarist Ali after the show, he revealed Ty Segall and Black Rebel Motorcycle Club as other shaping influences. Mugstar laid down their gauntlet as soon as they took the stage. The chatter was broken as the band hammered out the opening notes of their first track, accompanied by reverb and delay-drenched howls. Simultaneously the darkness of the stage splintered as psychedelic projections spilled over the band, swirling and pulsating in marriage with the music. This set the tone for their set, one that never let up… and it really was intense. 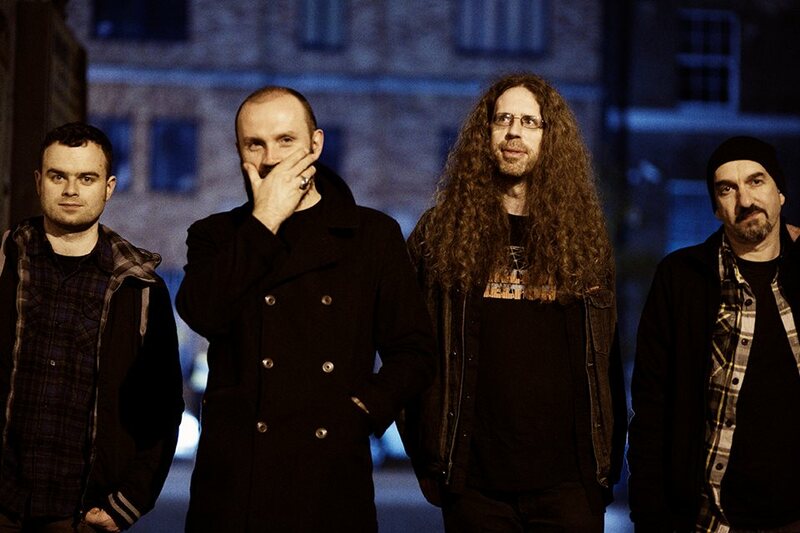 Mugstar have recently done some shows with the post-rock legends Mogwai, and it is clear why they were booked, mustering up a similarly epic visual spectacle, accompanied by a mind-bending wall of sound. The audience, which had grown considerably since Strange Collective, became impassioned. Lost in the throbbing rhythms asserted by Steve Ashton, their drummer, the intensity of his drumming laying a solid foundation over which the other musicians could weave their riffs. Jason Stoll aggressively established his fuzzed out bass lines on his Rickenbacker and Neil Murphy took on most of the guitar duties, playing with an intense concentration on the task in hand, whilst also immersing himself in the music. He seems to have been plucked straight from Woodstock in ’69, donning near hip-length curly hair, circular glasses and a battered, retro guitar. Pete Smyth their singer, guitar and keyboard player alternated between grunts shrieks, manipulated to almost demonic effect by the vocal effects. He also added high-end textural elements; coercing squealing feedback from his amp, slide effects on his guitar and kraut-rock flavoured keyboard lines. He was obviously also no stranger to the seminal sounds produced by Ray Manczarek, keyboard player from The Doors. Despite clearly being a drone band, there was also a hint of prog, calling to mind the sounds of Mastodon. After 45 minutes or so of unapologetic noise, Mugstar roared to a climax before finishing, ready for The Warlocks. Anyone interested in drone music should definitely give these guys some time. The Warlocks originated from LA, emerging in 1998, and have undergone various lineup changes. The only constant member is guitarist/singer Bobby Hecksher, who is also the main creative force behind the band. Requesting the stage to be bathed in red light, The Warlocks began their set. However, after the first song, Hecksher silenced the band. He requested the audience take a minute of silence in order that he might establish the right mood after the Mugstar set which he said had been ‘draining’ due to the unrelenting volume. After this slightly strange moment, the current drummer George Serrano called the next song in and things proceeded. The current line-up was intriguing. The standard drums and bass were accompanied by three guitars (one of which moved to keyboard at times) and vocals. To begin with I couldn’t help feeling this was overkill on the guitar front, and at times it was. However equally, the effect of two guitars playing lines unison produced a slightly displaced, double tracked effect, which really added to the sonic colours deployed by the band. After the first few songs, it was clear that Hecksher was distracted. Early on he announced that he didn’t want to follow the set list and was going to mix it up. He really meant this, at one point beginning a song before he prematurely calling time on it, and quickly starting another. As the set progressed, he seemed more and more disinterested, and this feeling was replicated by the audience. Conversations with friends and mobile phones seemed ever more interesting to many. Suddenly after only about 30 minutes, Hecksher said his thank you’s and quickly left the stage, as an incredulous band and bemused, dwindling audience looked on. He didn’t return. The rest of the band attempted to resuscitate the gig, initiating a jam, and whilst being interesting, it was a lost cause. Finally the band left the stage angry and despondent. Overall, it was a shame that the gig had to end on that note, after such an exhilarating set by Mugstar. That aside, I look forward to hearing more of what Harvest Sun and Bam! Bam! Bam! can offer.